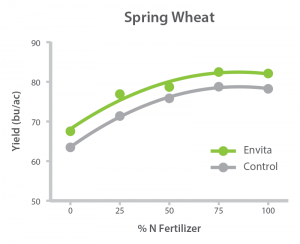 With Envita™ use, yield increases on average of 7% have been recorded in both winter and spring wheat. Alternatively, Envita allows the ability to reduce N use by over 60% and maintain an average yield. Try Envita for your wheat crops today by registering today.